Philippe Kubler (his Domaine, Paul Kubler, still bears the name of his father) is an intensely passionate, incredibly talented winemaker with a top-notch resume and, most importantly, top-notch wines. Beginning with the 2004 vintage, Philippe took over his family's Domaine. Domaine Kubler is made up of only 9 hectares (about 22 acres) and the average age of the vines is over 30 years-old. He picks the grapes by hand and ages his wines in Alsatian oak foudres (big oak casks) for 8-10 months. The Kublers have been making wine here since 1620. This wine comes from a single vineyard planted on sandstone and limestone soils. 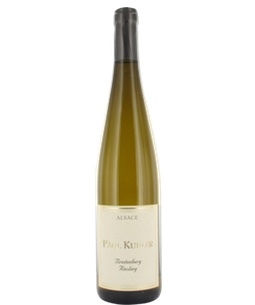 It is structured with flavors of peaches and citrus with telltale spices. It is unctuous and deserves a wonderful fish dinner with perhaps even a creamy sauce. But, you know another great thing about Riesling is its perfect marriage with sushi.